This post was written by Laura Gibbs after she participated in the Virtual Connecting session at OER16. It was originally posted on her OU Digital Blog at http://oudigitools.blogspot.com.eg/2016/04/virtually-connecting-oer16.html. Okay, power is back up now, so I need to get to WORK … but in this offline time, I wrote up some notes after the #OER16 hangout to share, and here they are. Thanks so much to the great people at Virtually Connecting for organizing the hangout! I had fun doing the #OER16 hangout this morning… and the timing was weird but good: the power guys were working on our generator today and they needed to shut off the power at 11AM my time (plus or minus), so I was just able to participate. Hangout’s over, and I’m offline now, without power, typing up some notes while they are still fresh in mind. Jim Groom and Catherine Cronin were both super, and what they were talking about was so relevant to the questions we are facing at OU, so I am really glad I got to participate. I’ll post these notes when the power comes back later today! Jim’s discussion of the ambivalence about open and especially about open content / OERs sounds very similar to the ambivalence that I feel about online too. In the same way that some of the economies of OER are displacing discussions about teaching or, even worse, subverting teachers (Jim mentioned Trump et al. being interested in OERs as a cost-saving, teacher-eliminating strategy), so too with online: I am the world’s biggest believer that online learning offers us incredible new opportunities, but at the same time I am well aware of how online is also being promoted as a way to strip schooling down to some kind of digital minimum, with massive numbers of students and a pedagogy of machine-graded multiple-choice questions. So, I want to believe that better teaching and learning is what we are talking about when we talk about open and when we talk about online… but that is not necessarily how others are going to understand those same words (open, online) and their implications. What words do we use to convey those larger purposes? How can we best show that open and online are not goals in and of themselves but instead the means by which we are achieving larger goals … goals like better teaching and learning, more educational access, and social justice inside and outside of our schools…? These are all important concerns, and I am glad to say that I actually find it both exciting and inspiring to work on solutions in my classes. I really want to show my students how the opportunities of going open and online can make their experience in my class more meaningful… often much to their own surprise based on their experience with cookie-cutter online courses they have taken previously. They may arrive with fears and/or prejudices about online courses, but by working together as a learning community for 15 weeks, we make great things happen, and I am constantly getting new ideas and feedback from the students to help make the classes even better next time. By working outside the LMS and choosing their own tools (they choose their own blogging platform and web publishing platform), students can share or conceal their identity as they wish: they might use their full name or a pseudonym or just their initials at their blog, and they might or might not put their name on their website project for class – that’s up to them, and allowing them to make their own choices is one of those advantages that a flexible online learning environment allows. So, inside my classes, I always feel like we are making progress, learning, experimenting, growing, going forward. Yet on the institutional level, I don’t have that sense of progress at all. We have a great grant program for OER, but it’s very much focused on cost-savings by using textbook replacements, without making explicit a framework of open teaching and open learning. We are about to adopt Canvas, an LMS that actually does allow for more openness than was possible with D2L (where you could not open up your class content even if you wanted to), but at least so far, there hasn’t been much talk about those open options. We have a great Domain of One’s Own project running now called OU Create, but it’s very much at the margins, as all the online innovation has been at my school for the past 20 years. So, just to take one example, although I teach for one of the largest online course programs on our campus (the online courses administered by our College of Arts and Sciences), there has not been any promotion of OU Create through that program which is still focused squarely on the LMS. In short, fear of open is alive and well on my campus. The fears are real, so the question is: how to grow beyond them…? 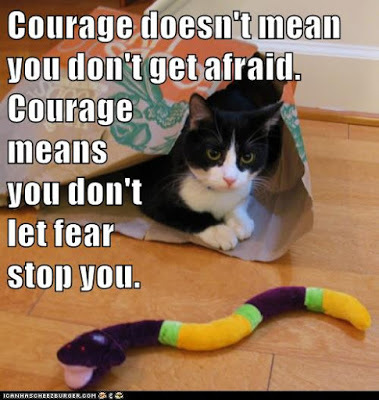 And yes, I have a growth cat for that: Courage doesn’t mean you don’t get afraid; courage means you don’t let fear stop you. And I’m eager to hear about success stories! For example, I am always inspired by what I hear coming out of CSUCI and the work Michelle Pacansky-Brock is doing with online instructors there, and I am really excited about going up to VCU next month for AltFest to learn about their successes there in developing online experiences for faculty to help them explore the open online world. A few days ago, in this blog I put out a plea for an online learning community at my school in conjunction with our coming LMS transition… will it happen? I really hope so: this is an opportunity we probably will not have again for many years (it’s been 10 years since our last LMS transition). I would love to see the LMS discussion expand beyond just FAQs about features into something bigger! And as I type this OFFLINE while the power is off, I am just itching to go back online and watch Catherine and Jim’s keynote presentations to get some more ideas. There is so much progress to be made but so much work to do for that to happen. And ideas to share! Thanks so much to Helen for inviting me to do this hangout and for all the Virtually Connecting crew who make these things happen: I knew it would probably catalyze a blog post… and so it did! Wow, thanks for including this here! The session was so energizing yesterday, and I am excited about being an onsite person for VCU AltFest where Autumm is going to be the VC magician! I watched a VC hangout that same evening from OLCInnovate: hopping two conferences on two continents in one day. That is very cool: thank you for making all this happen!